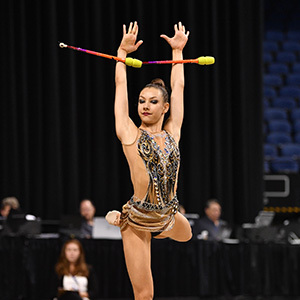 SOFIA, Bulgaria, April 13, 2019 – Evita Griskenas of Orland Park, Ill./North Shore Rhythmic Gymnastics Center, will compete in three of the four event finals – hoop, clubs and ribbon – tomorrow at the Sofia (Bulgaria) World Cup at the Arena Armeec, along with the U.S. senior group’s participating in the 5 balls final. Competition concludes with the event finals at 4 p.m. Sofia time. U.S. fans can watch the action live at OlympicChannel.com via its livestream at 9:45 a.m. ET, and tape-delayed on the Olympic Channel at 8 p.m., with a simulcast. In the all-around, Griskenas finished sixth overall at 77.350. Camilla Feeley of Deerfield, Ill/North Shore Rhythmic Gymnastics Center, finished 21st. Russia’s Aleksandra Soldatova claimed the all-around title at 82.450. Israel’s Linoy Ashram was second (80.450), with Bulgaria’s Katrin Taseva third (80.150). 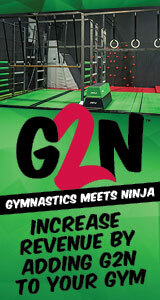 Griskenas earned a 20.900 in the clubs qualification round, which put her in fifth and in the event final. Feeley’s 18.350 gave her the 16th spot. Ukraine’s Vlada Nikolchenko tallied the best score with a 21.950. In the ribbon qualification round, Griskenas was seventh at 18.100, and Feeley was 28th at 14.750. Ashram had the top mark of 19.250. The U.S. group will compete in the 5 balls final. The Americans finished in eighth place in the all-around at 39.400, after finishing ninth in 3 hoops/4 clubs at 18.750 and serving as first reserve for tomorrow’s final. Bulgaria won the all-around at 49.350, with Italy next at 48.200 and Japan rounding out the top three at 46.800. The members of the U.S. senior group, which trains at North Shore Rhythmic Gymnastics Center, are: Isabelle Connor of Manhattan Beach, Calif.; Connie Du of Deerfield, Ill.; Yelyzaveta Merenzon of Buffalo Grove, Ill.; Elizaveta Pletneva of Deerfield; Nicole Sladkov of Vernon Hills, Ill.; and Kristina Sobolevskaya of Chicago. Fans can find additional information on the event’s Facebook page and official website.